I have a question for you this week. What do you do with a notebook? 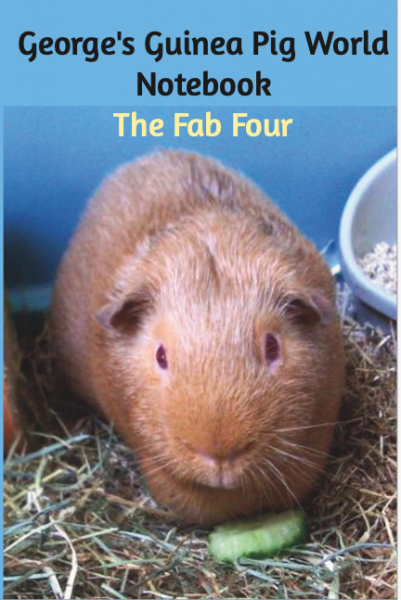 Mam’s been asking us whether she should do a notebook for George’s Guinea Pig World, with pictures and wise words to go with them, and plenty of space for you to use. I don’t really understand her myself, but then I don’t write. I don’t see Mam write much either, although she does sometimes scribble something on the back of one of the envelopes she keeps by this keyboard. The one next to me right now has questions scribbled on it from quiz programmes. That’s because she sets a quiz once a month, and that’s the night she’s always very late home. Oh, I do see her write in a very small notebook she keeps by the weighing scales. She puts our weights in that (no change, by the way), and any other notes on trimming toes, having baths, etc. She wants to know if readers would like a notebook. Would you like it with lines or blank? Would you like sections for weights, or perhaps for medicines (dose per weight and how often, that sort of thing)? It would have lovely colour photos of George and Fred (and maybe others) in it, and probably be around 80 pages, and cost between £12 and £15. It would be a lovely gift for a fan or a guinea pig friend. Well, pictures of me would be a lovely gift. Maybe she’ll get around to doing that if this one of George and Fred (and maybe others) is popular. 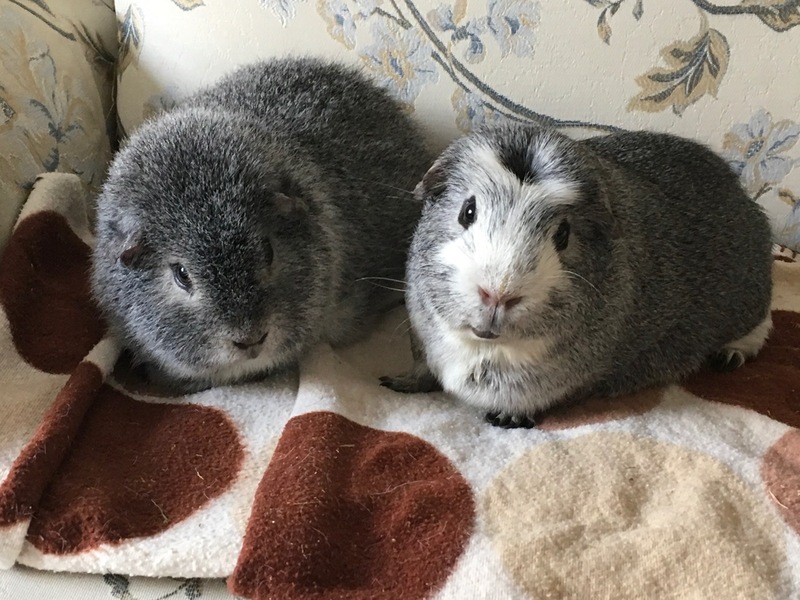 George’s Guinea Pig World Notebook: Roscoe edition. I like the sound of that. PS the cover pic is just a mock-up, Mummy says. She’s got to get the old computer out for full-sized pictures. Or something. Hi there, Bertie here. It’s my birthday on Thursday! I’ll be two years old. Biggles will be two, too. Mummy says we can have a party in the living room again. I like parties. We had a great time last year. But now I feel sad, because last year I was with Midge and Percy having a good time. Mummy says they were some of her favourite pictures of the year, the three of us gathered around my cake. But this year we might all get together if I promise not to argue with Biggles. Or Roscoe. Roscoe and I have been having chats through our cages, and also chats on the floor in the kitchen when we change over. But only short ones. It’s because Roscoe’s older than me and doesn’t agree that I’m in charge. We have a conversation about it and then I try to put my foot down and Mummy steps in and picks one of other of us up before we can get cross with each other. She wouldn’t need to do that if Roscoe would only agree with me. On the diet front, we all lost weight this week except for Biggles. Mummy’s very pleased with us. We’re very pleased with Mummy, too, although she said she had a bad day yesterday. If we doled out her food for her, she wouldn’t be able to help herself to other things. That’s her problem, really. Have a nice week and hopefully we’ll have some new party pictures for you next time. It’s the last day of the year, Mam reckons. She also says she doesn’t really know what day it is, although she did manage to turn up on the right day for her golf and to collect Uncle James, who’s staying at the moment. I reckon I saw Uncle James last year, but I don’t remember him too well. He seems like a nice chap, anyway. Last week, the day after Bertie posted, it was Christmas day. We had presents that Mam helped us unwrap while we had our Christmas morning cuddles. Neville and I have a wonderful box with hay inside it and grass on the outside. It makes a lovely noise when we chew it, too. Bertie and Biggles are jealous, even though they each got a couple of tasty sticks that hang on the side of the cage. What we didn’t reckon on was Mam deciding we’d got invisible mites making us scratch too much. Well, something was kind of itchy. Even Bertie started scratching , so Mam stuck some wet stuff behind our ears the day after Christmas. It was okay at first, and the next day, but as time went on I didn’t feel like eating much, and neither did Nev or Bertie. Mammy asked us if we were poorly, we were so quiet. But next day we felt fine again, and she weighed us all and said we were still too heavy and hadn’t lost any weight last week. It was all those yummy carrots we had on our holiday, Mammy. Between you and me, I reckon Mam’s been eating too many carrots this Christmas too. She says we all have to do more exercise and eat less starting today and onwards into the new year. I’ll be right behind you, Mam. We had a lovely holiday – and now it’s Christmas! We got back from our holiday the other day, after a long drive in our boxes, but not as long as it had on the way to get to our holiday. Mummy didn’t go round in circles, for one thing. Well, not as many, anyway. I sort of enjoyed the holiday because I had a nice peaceful time and I could look out of the window. It rained every other day. Mummy went out every day, but sometimes she came in when it was still light. Sometimes she went out to have a walk, and then she came back and went out in the evening. So, yes, Auntie Dawn, I think she saw some feathery things but she was all excited about something on the grass near the sheep on the first day that she said were red wings. We didn’t go out on the grass because it was too wet, but we did have a nice run on the floor of the cottage. The floor was very nice because it had underfloor heating, but it was nice, not too hot. We also had visitors. Auntie Cathy and Uncle Phill came one day and then they went out, but they still had time to cuddle us. The next day Auntie Teresa and Sam and Dani came. If Mummy is Cathy and Teresa’s auntie, does that make us their cousins? Dani is the person who does Mummy’s cover illustrations. I liked her a lot. I think you saw our setup from Roscoe’s message last week, so I won’t put a lot more photos up of that. We’re getting ready for Christmas now. Mummy says that’s tomorrow. We had our photos taken under the Christmas tree, which has some presents under it. There weren’t any for us, though. Mummy says ours will arrive tonight, along, possibly, with some more for her from Santa. I hope she doesn’t get any more guinea pigs, though. We haven’t enough room for them if we go on holiday. I hope you have a lovely Christmas with lots of presents. I’m hoping for something edible. I think we all are. Mummy says she’s putting us all on a diet, though. Including herself. Well, if you must go out for meals with your friends and family every night for a week, Mummy…. Way-aye, Roscoe here again, calling from the wilds of Hampshire. That’s a place in England that’s miles away from home in Norfolk. It was a very long journey to get here, and it felt like Mummy was driving in circles at one point, but she straightened up, and we arrived at the cottage in the afternoon when it was still light. Bertie is in the blue cage on the shelf above us. Biggles is in the box the cage came in, and he’s beside us. We’re in a run in a nice alcove, with our travel box to walk into if we want to be extra cosy. And we’ve all got our tunnels and beds. There’s also a run connected to ours, so everyone has some floor time. Mummy keeps going out but when she gets back she lets me and Nev out into the run some more. The food is good, the room is nice, and Mummy seems like she’s enjoying herself. It’s too cold and wet to go outside and try the grass but there are sheep and birds on it. Mummy says if we come back in spring or summer we can try it out then. Sounds good to me. Here are some photos.